September, 2014 – The wild skies in Wyoming’s Grand Teton National Park settled down after a while, and clear blue skies began to rein. We continued our morning ritual of hopping out of bed before dawn to run down to the scenic viewpoints to catch the sunrise. As the sun rose, pastel shades would silently creep across the sky and then spread across the water below in beautiful mirrored reflections. The sunrise was different every day, and each one was lovely in its own way. 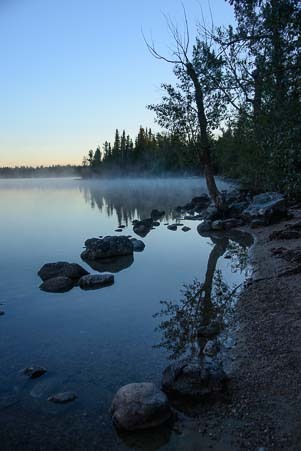 Just before sunrise, mist floats along the base of the Tetons. At the same place on another day, the mountains blush and check their reflections in the water. This business of running around before dawn turned out to be surprisingly popular in the Tetons. Every morning, headlights pierced the cold black air heading in both directions on the highway, and brake lights lined up at the turn-offs to the viewpoints. At first we thought the Tetons were full of crazy photographers. But we soon figured out that lots of these people were fishermen, wildlife stalkers and folks getting an early start for their day’s hike. 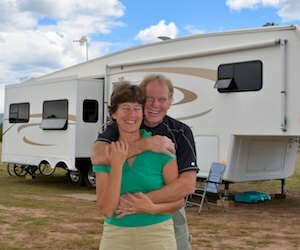 So much for R&R when you take a vacation to Grand Teton National Park! 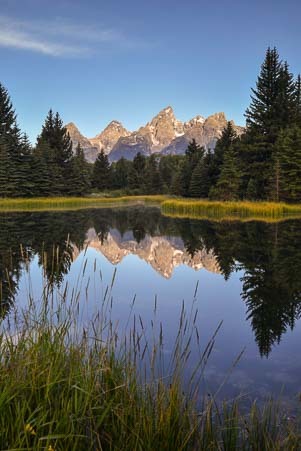 What we loved, though, was the stillness of the water and the way its glassy surface mirrored the sawtooth mountain peaks as they changed shades in the morning light. Prefect stillness… for a split second! We returned to Shawbacher’s Landing several times to capture these special moments, and every single time we were teased by the dam-building beavers. know when it’s time to bite and run? Each morning, it was guaranteed that until the sun crested the horizon to the east, the beavers would sit on the tops of their dams, silhouetted perfectly. They looked so cute and stood so incredibly still as they posed for us, little hunched figures on top of their world. However, in such hopelessly dim light there wasn’t a chance in heck of getting that dreamed of beaver-sitting-on-his-dam portrait. A dam built by a beaver, nature’s engineer. Of course, just as the colorful magic in the sky would begin, the beavers would all jump in the water and swim around, totally messing up the reflections. They’d drag branches to and fro between their dams, true to their reputation as nature’s industrious little engineers, but they’d leave the water completely rippled, shattering the pink mirrored mountains into a zig-zag pattern of fractured images. 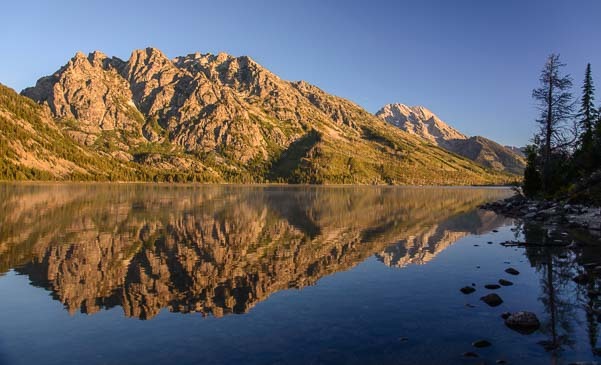 The mirrored reflection of the mountains stretched clear across Jenny Lake. 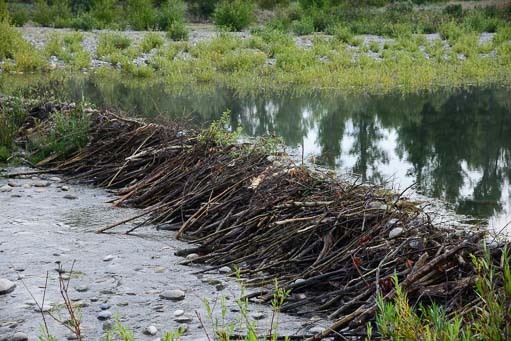 The photographers that were lined up on the shore would moan and grumble to each other about those damn beavers, throwing up their hands in total frustration. 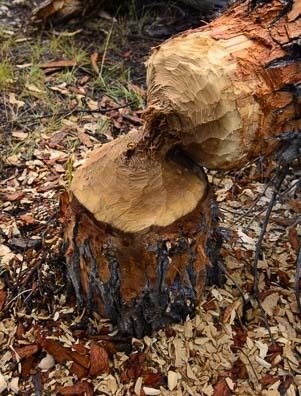 They’d call out to the beavers, telling them to get out of the way, and pleading with them to hold off on construction until the work day actually started in another hour or two. Sometimes the water would settle for a split second, and then a flurry of shutter clicks would fly. 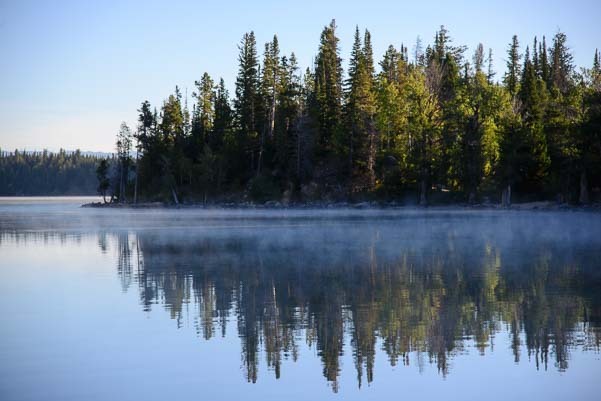 Pines mirrored in the mist at Jenny Lake. Triumphant grins would flash between us all, only to be followed by another series of loud groans when a fish would snag a bug on the water’s surface, sending out a ring of ripples. 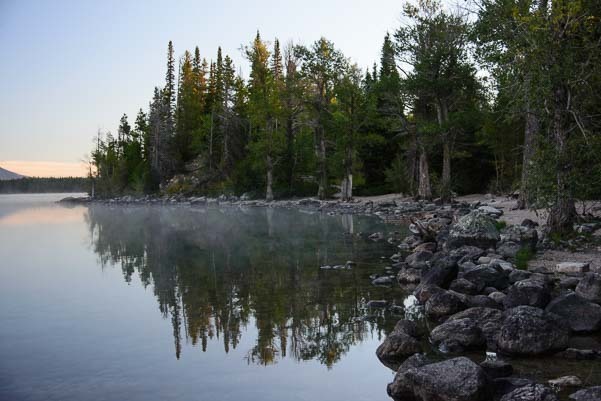 Once the light show was over, of course, and the sun rose high enough to bathe the scene in stark, bright light, the beavers would vanish into thin air, nowhere to be found, and the water would resume its glassy state, a little late. So it goes with nature photography. We were captivated by the beauty around us. Jenny Lake sits in the middle of Grand Teton National Park, and there is a 10 minute ferry ride that shuttles people to the far side where there are several wonderful hikes. Wandering down to the boathouse one afternoon, we discovered that this ferry ride is $15 per person all day long, but the very first boat ride at 7:00 a.m. is just $5. What a deal! We were there! So, on yet another ice cold morning, we dashed off in the truck, only to arrive at Jenny Lake and discover that now that Labor Day was behind us, the ferries were on a Fall schedule. There was no early morning discount deal. The water was like glass. In fact, there were no ferries at all until 10:00 a.m. 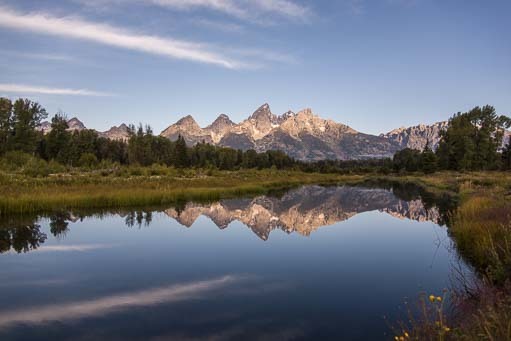 But this turned out to be a blessing in disguise, as we were now on the shores of Jenny Lake at dawn, a time and place where the Tetons quietly radiate their greatest majesty. 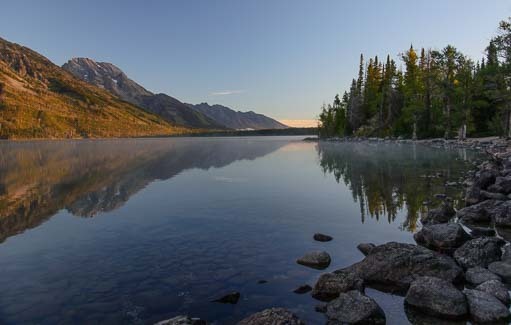 Mist rises from Jenny Lake. The mist was rising off the surface of the water, and we suddenly had nothing to do but wander along the edge of the lake and take in the beautiful scene. 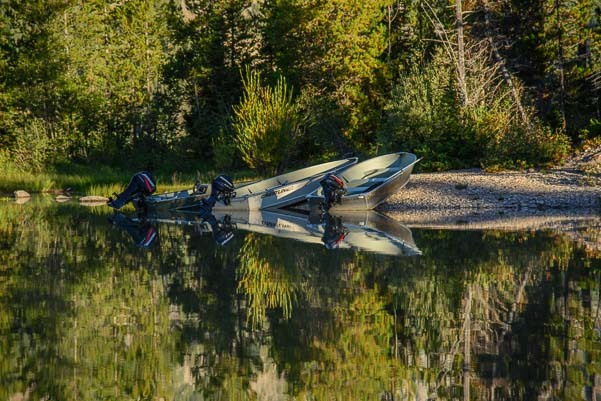 Talk about mirrored reflections on the water! The whole lake was crystal clear and utterly ripple free! 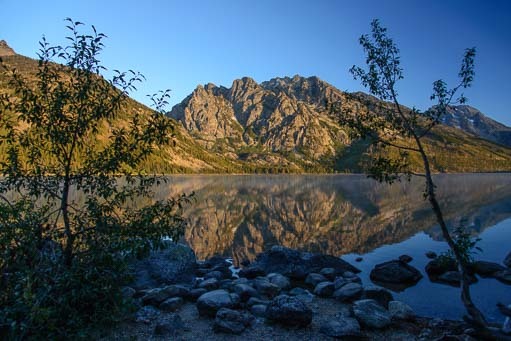 Jenny Lake is a magical spot at dawn. There was less than a handful of other people down at the lake, and we were all walking around with dreamy smiles on our faces. Granted, we all needed coffee, and we all had red, runny noses, but we all knew this was life at its finest. 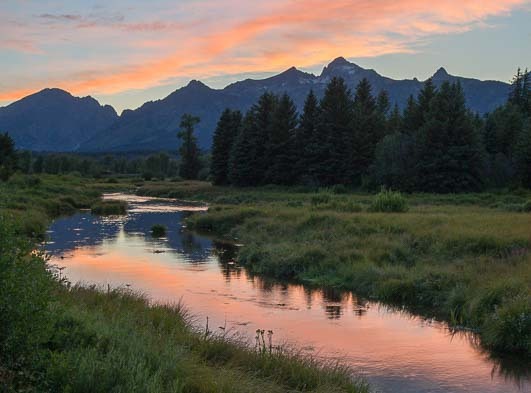 The world was asleep, snug in their sleeping bags or rustic cabins or plush hotels in Jackson Hole, but a breathtaking dawn was silently unfolding around us lucky ones right here. Time stood still as the mountains gradually glowed fiery orange. All this bravado and show was just nature’s way of stretching and shaking off the cold stiffness of the night air before getting up. Dinghies and trees on the beach made beautiful patterns. It was a magic moment that swept us up in its glory, so singular and so special for us that it would stay in our memories forever. But it happens every day, day after day. How lucky we felt to have witnessed it. How fortunate we were to be in this spot on this morning to watch the vibrant light grow and fade, to see the mist rise and dissipate from the water. 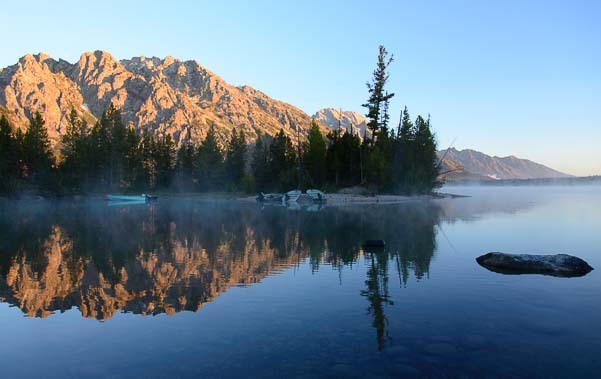 At the same time, how reassuring it was to know that it is always there for everyone, every morning… Jenny Lake at dawn. 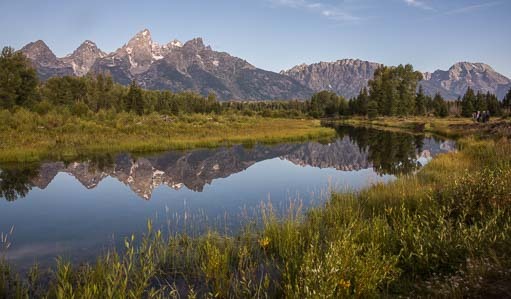 Visit these links for the Official Grand Teton National Park website and Wikipedia’s Grand Teton National Park entry. 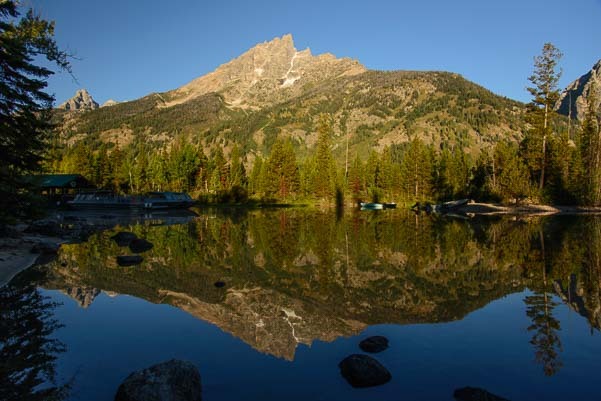 Here is a little more about Jenny Lake and the Jenny Lake ferry. This entry was posted in Wyoming and tagged Grand Teton National Park Wyoming, National Parks US, New, Travel, USA, WP Travel, Wyoming by Roads Less Traveled. Bookmark the permalink.